Do you have a Valentine’s Day party to plan? Or maybe you are just looking for a simple way to make Valentine’s Day special with your kids. This little craft has been such a success when I’ve tried it with groups of kids. I especially love doing it because the project involves very little prep or clean-up for mom. It turns out great for everyone (even if they are not artistic), and the materials cost very little. If you buy the 2.5 lb container of clay, you will have enough to make 12 small bowls. 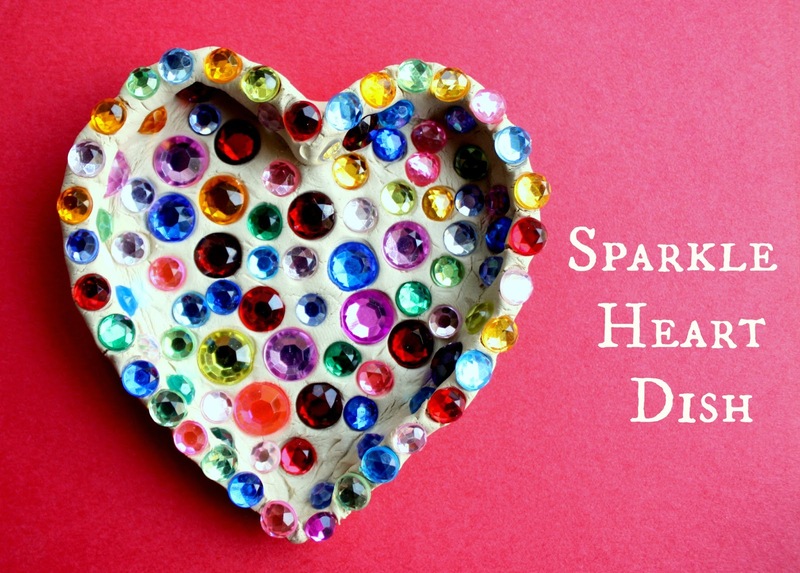 (If you have boys in your group that you think would be less than enthused by the rhinestones, you could use other materials for decoration, such as crushed shells or small pieces of colored plastic). Have everyone form their chunk of clay into a round, smooth ball. Push an indentation in the ball with your thumb. Widen the indentation and raise the sides to form a little bowl. Smooth any cracks in the edges as you go (small children may need help). Pinch the bowl at the top and bottom to form a heart. Start adding jewels to the bottom of the bowl. Make sure to push them firmly into the clay. If they are only shallowly secured, they will fall out once the clay hardens. Add small jewels around the lip of the dish and the sides if you wish, but if your children are small you may want to skip this step because it can be difficult to maintain the shape of the dish while still pushing the jewels in deeply. The clay in the dishes only take about 10 hours before it is hard enough to firmly hold the heart shape. From there, they can be given as gifts or just enjoyed. Kids love finding little trinkets and treasures to fill them! Katey writes about other homemade and inexpensive activities on her blog, Having Fun at Home.